Sitting for two hours in a dark room with a hundred strangers. 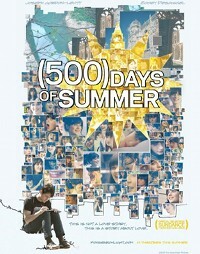 (500) Days of Summer (don’t forget the parentheses!) is a conventional boy-meets-girl story dressed up with a bundle of enjoyable and inventive extras. It’s a lot of fun. The film-makers dug deep into their box of tricks for this film. The timeline zooms back and forth across the 500 days. A voiceover occasionally offers explanations. There’s a surreal moment when the thunderstruck protagonist turns into a drawing and gets erased, and an even more surreal song-and-dance number during an earlier happy moment. That guy from The Office (who despite many other noteworthy roles including this one is destined always to be known only as “That guy from The Office“) really is pretty funny. He’s much more likeable in this film than the painful idiots he plays in The Office and Extras. 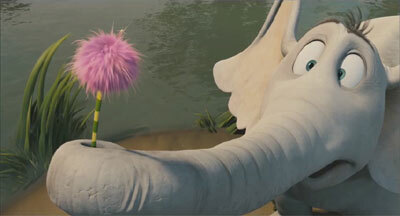 I had a great time at this big, fun and loud film about a big, fun and loud elephant. The story of Horton and the Whos is one of my 2-year-old son‘s favourite stories, so this was a good choice as his first ever cinema experience. He enjoyed it, and so did we. In the manner of kids’ films these days, there were lots of jokes for the adults. During the anime sequence I was crying tears of laughter. That doesn’t happen to me that often — maybe because I don’t go to very many films. Anyway, this is definitely worth seeing. And it confirmed to me that any film is improved by watching it with a 2-year-old. Now this was an excellent adaptation of an unusual novel. Very cinematic and dark and not at all blockbustery. It was about 6 years ago that I read Patrick Suskind’s novel, but I still remember it quite well and the film captured its tone nicely. I saw the film with Joanne at the Sky City Gold Class cinema, which was quite appropriate: as we watched the film we were able to relax in our armchairs and enjoy the aromas of our chicken nibbles and glasses of wine. This film is a funny mockumentary about competing Australian children’s dance schools. “Mr Jonathan” the main character, was hilarious in an Alan Partridge sort of way. The whole cast including the kids were good and the tone was mostly pretty convincing. And there was even some pretty good dancing. This was both inspirational and nostalgic, inasmuch as one can be nostalgic for things that never happened. Such clever and learned teachers and classmates would have made school much more stimulating. Iâ€™d like to read the script of the movie sometime. 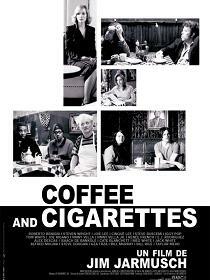 Coffee and Cigarettes is a quirky and amusing film by Jim Jarmusch. It’s divided up into about a dozen segments; each one features a couple of people sitting in a cafe, drinking coffee, smoking cigarettes and talking. The segments are mostly unrelated, but some themes and even dialogue recur throughout the film. It’s fun seeing so many famous faces in such a downbeat film — there are players from acting’s A-list (Cate Blanchett, Bill Murray), musicians old and new (Iggy Pop, the White Stripes and others) and one or two that I had never heard of.